The fault, dear Brutus, lies not in our stars…. I hear voices inside my head, which could be a scary thing, but it’s not. The voices I hear are the characters in books so well written that no doubt I could look up and find the book’s characters in the room with me and not bat an eye. Sheepishly, I must admit, this is the first John Green book I have read. He has tons of fans in Sandwich so it is not without embarressment that I say this. The Fault in Our Stars is filled with dialogue – the inner dialogue of Hazel Grace often – and the dialogue between Hazel, her parents, her friends and, mostly and unforgettably, with Augustus Waters. Hazel Grace and Augustus are part of a ‘Support Group,’ cancer support group. They are 17 and dangle around each other early on in the book without any recognition of what will eventually become their story, something the living will remember and the dead will carry onto the next stop. All I can say is ‘Wow’. Clarity in writing is not so easy to manufacture. The language and scene descriptions are definitely clarity nailed solid. Reading the story is like picking through the shells of cracked pecans to get those sweet little nuts and being sad that we had to crack those perfect shells in the first place. 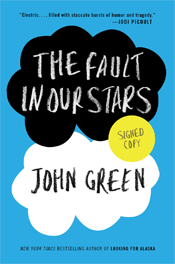 People have been cracked in this story: Isaac, who is blind because of cancer in the eye; Hazel Grace, who surviving in Stage 4 cancer longer than anyone thought she could; Augustus, handsome and charming and still dreaming of a life uncancerous, when – like star-crossed lovers – he and Hazel Grace are brought together in the Cancer Universe. It’s their story, mostly. Inside this book is the relationship of doomed lovers; a trip to Amsterdam to meet with an iconic, isolated author of a book that is featured prominently in the lives of these two; description of lives invaded by cancer, mentally and physically; humor; realism….a lot. John Green does not bang you over the head with the monstrousness of young people brought down by disease. We all kind of know that, I think. It’s these voices you can hear of being forced, nudged and bludgeoned to be present in each painful, glorious, humiliating, loving moment that’s left to you. I love a book that takes honesty for what it is – all encompassing, the good, the bad and the ugly. If I had a criticism, it would be again the dialogue. Just that there is always an answer to the question posed, but not floridly, just dialogue so good that I think, can we always be this lucid when we are dying? I’ll find out some day. The part of getting older – yes, I am going to refer to being older – that is amazing and frustrating, is the part that makes you the sum total of all your experiences, but not totally. Like you are still that 5 year old in grandma’s house or the twenty something making a huge mistake, and those experiences linger and still color thoughts. What if, what if, even while you are in your teens, you pull upon your adult self to deal with life. You haven’t even been an adult yet but there you are pulling something out of you ‘way beyond your years.’ So maybe the collective human experience is accessed when needed as in Hazel’s and Augustus’ experience, ‘way beyond their years’ because they don’t have years and never will. John Green is an exceptional author and I hope you read this book. Shut it when you need to, but finish it. Steal Like an Artist……this is not a crime memorandum. 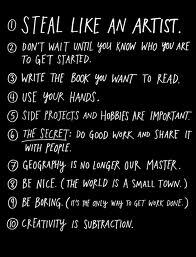 Not bad advice. Try it out on one of those 2012 graduates and make sure you stay in contact with them for the next few decades. Change is inevitable.